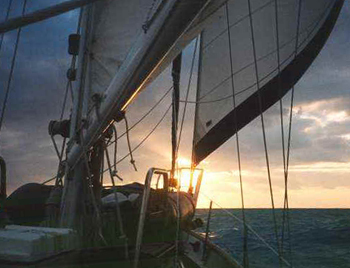 Responsibly skipper and crew an inboard auxiliary powered cruising sailboat for coastal or offshore passages in strong to heavy conditions, including zero visibility and nighttime, in unfamiliar waters out of sight of land. It isn’t until you have sailed out of sight of land and the sun begins to set that you get the full sensation of the offshore sailor. It will be at this point that you appreciate the historic attraction of the sea. Practical applications of Coastal Navigation and Ded Reckoning as well as the application of previous course material are necessary to successfully complete this course. You will draw on all previous knowledge to safely arrive at your destination. In the offshore environment, mistakes can be costly. All of the lower level courses are designed to prepare you for this course. Taught only on the ocean, this is the course in which you encounter inclement weather, overnight sailing, and zero-visibility. Look for seasoned ocean sailors with extensive offshore experience when choosing your instructional facility. Our instructors have weathered hurricanes, crossed oceans & seas, and sailed internationally. While this particular course may not be for everyone, it should be comforting to know that you are learning from instructors qualified to this level of sailing!